Despite an already saturated free-to-play MMO market, Fiesta Online shows surprising resilience in fending off its rivals. With the North American version (published by Outspark) nearing its fourth birthday, the game remains a strong competitor with a loyal fan base. Fiesta’s selling point is its charm; its anime-style graphics and array of colorful monsters, maps and equipment are enough to woo even the stoniest of hearts. Even the fearsome dragons look adorable. Fighters, physically strong but with no magical aptitude. Archers, skilled at range but weak in melee. Mages, glass cannons skilled with magic. Tricksters, nimble but fragile assassins. Clerics, indispensible healers built for party play. The class system is incredibly customizable; skills are learned every few levels and each of these can be upgraded as the player wishes (to do additional damage or have a reduced cooldown, for instance). 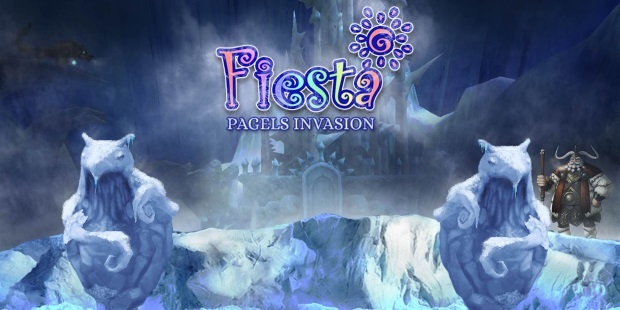 Towards the end of the game, players are given the opportunity to specialize their class (Fighters for instance may specialise as offensive Gladiators or defensive Knights), giving Fiesta ten different classes at end-game. As with any good MMO, the more flesh on show, the stronger the character. The game world itself is brightly colored, and the game’s cell-shaded characters and vibrant horizons completely contrast the broken and at-war world in which the game is set. Anybody who looks around the game website may stumble upon the incredibly alluring storyline involving warring Gods, betrayal, and death. However, the game itself shares little of this beautiful story, and players are instead instructed (through a series of incredibly repetitive “go to this place and kill that monsters then come back to me to rinse and repeat”) to embark on a quest in which the only goal is total pointlessness. While quests do provide a significant amount of signposting throughout the game (including a helpful quest finding feature which overlays maps to point you in the right direction), the amount of running from place to place means that players may choose to grind in a single spot, as doing so requires less effort and is just as efficient. The game has a heavy grind element to it, and this kicks in after the first twenty or so levels. Kingdom Quests are group quests that run several times a day, calling on all adventurers to band together to defeat exceptionally strong monsters, and provide a break from the monotonous go-and-kill or go-and-fetch quests, as well as encouraging group play. Beyond this, the game’s community is enhanced by a guild system (which also provides rewards for players as they level), as well as guild Academies: free-for-all groups that anybody can join. Players generally are respectful, some even offering help and items to newbies, though this is uncommon. The final community option is PvP, which is introduced early in the game. Free-for-all arenas (called BattleZones) are dotted around various cities, accessible by talking to their Gatekeeper. BattleZones are divided by level to maintain a fair playing field, though this is somewhat destroyed by the cash shop (with cash shop equipment being grossly overpowered in comparison to equipment found in the game). Fiesta boasts a wide range of unique gameplay elements that compensate for its dry quest system. Gameplay is enhanced by Alchemy, Fiesta’s gathering and creation system. The world is dotted with herbs, metal nodes, treasure chests, and other goodies, and all of these can be farmed for raw materials. Players then use these with Alchemy to create potions, weapon enhancements, or buff scrolls. This constant need for new materials keeps the market fresh, and money-sinks throughout the game prevent inflation from becoming unbearable (as is a common issue with many ageing MMOs). Another of these features is the title system, which allows players to prefix their character name with a title. Titles are rewards for various feats of strength, similar to an achievement system, with over one hundred different titles available. As previously mentioned the game is free-to-play but is funded primarily through a cash shop. SparkCash can be traded for a variety of powerful items, such as wings, rideable mounts, buff scrolls, enhancement items, and equipment. A large number of these are not permanent items and disappear after 30 days, encouraging players to keep investing in SparkCash to keep their characters well-equipped. The end result is that a fully-geared player may end up paying far more than a pay-to-play game subscription. SparkCash can be bought via the Fiesta website, but can also be earned by filling out surveys and questionnaires provided by Outspark’s associates. While this is great for players unable or unwilling to access a credit card or PayPal, a number of the surveys require players to offer up important details such as phone numbers. As always, be careful of what information you give out online. Fiesta is the kind of game that players may find themselves logging into when they want to pass a few hours (then looking at the clock and seeing that it’s 3 AM), and has an addictive cuteness to its gameplay. The colorful graphics and upbeat (though repetitive) music provide a little light-heartedness to the MMO arena, and its expansive class system and profession system give the game some much-needed depth. Conversely however, the quest system and poor story integration leave role-players and story lovers frustrated, and those unable or unwilling to dig deep enough to pay for the incredibly expensive cash-shop may find their end-game and PvP experiences stunted. Overall, the game has survived well and has plenty to offer for those not looking for something too deep and time-consuming. Those looking for a deep engrossing story-line might be disappointed though. If you want a bit of MMO nostalgia be sure to check out Fiesta Online for yourself!